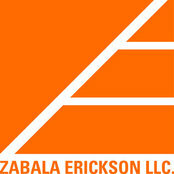 Zabala Erickson, LLC is a design firm based in Naples, FL. 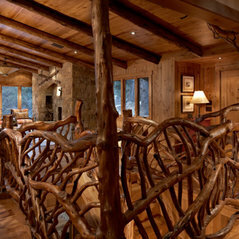 We primarily provide conceptualization, planning, and architectural services all over the US. Other focuses are interior and product design. Passion for the creative is the foundation of our mission. Aesthetic beauty and integrity, function and utility, efficiency and cost appropriateness; these are the benchmarks by which we judge our success. 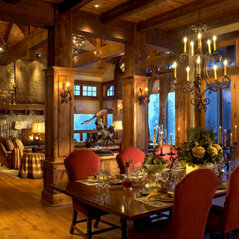 Services: Whether we are generating the seeds of ideas for new markets in India, redefining the upper limit of amenities a ski chalet in the Rockies should provide, or creating a vibrant new venue for a breakthrough restaurant, Zabala Erickson, LLC listens, creates, coordinates, and collaborates to facilitate its successful delivery. A keen eye for graphics, technical competency, and personal attentive service mark our product. History: Fernando Zabala and Carl Erickson came together to form Zabala Erickson, LLC in the summer of 2012. Their joined efforts go back to 2004 and over the ensuing years they designed numerous homes of significance distributed across the nation, hospitality projects both domestic and foreign, and commercial properties of distinction. 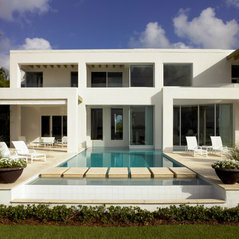 2013 continues this trend with active projects in New England, western Montana, and both coasts of Florida. No matter where you're located, we can provide our services so you can make your dream home a reality-give us a call today, we'd love to hear about your project! Commented: Are these custom cabinets? 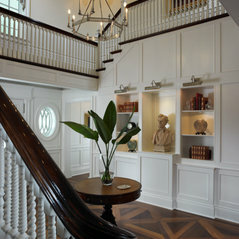 Where are the from?Yes, most all of our cabinetry is designed by us and custom produced. 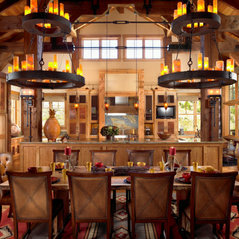 These were made by Continental Construction out of Bozeman (Belgrade), MT. Commented: Range Hood.It was custom designed and fabricated. Obviously an expensive way to go, but when the kitchen is this significant and the results are this stunning it is certainly worth it. Commented: How are the glass shelves installed?simple u-shaped aluminum channel set in the depth of the drywall. Commented: Can someone please tell me where the area rug is from?jonesdm is correct.